Mitchell Mirassou was a descendant of the family that founded Mirassou Winery in California. 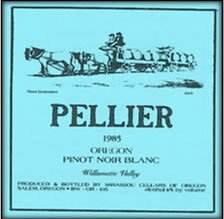 He and his wife Beverly moved to Oregon in 1981 and began planting a 45 acre vineyard on their 90 acre farm near Bethel Heights Vineyard in the Eola Hills north of Salem. They bonded their winery in 1985 and chose the name “Pellier” in order not to compete with the better known Mirassou label in California. “Pellier” came from Mitchell’s great grandmother, Henrietta Pellier (daughter of a French winemaker), who married Pierre Mirassou in the 1880’s. The winery opened to the public in 1986 and specialized in Pinot Noir, Riesling, and Gewurztraminer, and tried to make a go of producing a good Cabernet Sauvignon. The winemaker was Rudy Madrigal who had previously worked at Mirassou Winery in California. In 1992 the winery and vineyards were purchased by Paul and Eileen Gerrie and renamed Cristom Vineyards. The winery was located at 6785 Spring Valley Road NW, Salem, OR 97304.